detoxification. They are commonly used for skin toxins such as carbuncles, pimples, sores and ulcers. Mung beans are an effective antidote for the intake and overdose of many toxic substances, such as pesticide poisoning, drug poisoning and food poisoning. 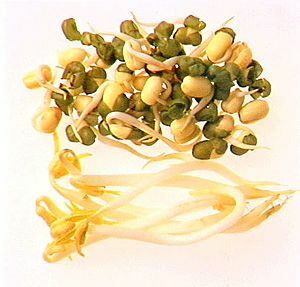 Mung beans also prevent summer heat stroke, by reducing body temperature, relieving thirst and sweating. The beans can be powdered to make a ‘mung bean flour’ and used creatively in various recipes, such as for making shortbread type cookies. These cookies melt in your mouth and have a very similar taste to peanut cookies, minus the peanut. Cream butter, powdered sugar and salt until creamy. Mix in sifted flours and hand knead until a dough is formed. 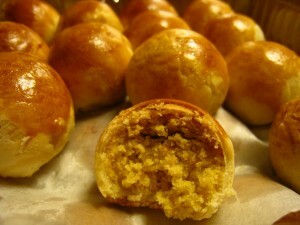 Scoop the dough with a teaspoon and roll into a ball. Brush the top of each cookie with the yolk glaze. Bake in preheated 300F oven for 20 minutes. Written by Lana at 10:24 pm and filed under Foods, Drinks, Recipes, Healthy Lifestyle, Miscellaneous. I made these for class. They are a lot like shortbread cookies. My kids even liked them. I had no idea that mung beans could be eaten like this. I have tried something like this with red bean paste, but this is new to me. I think this could help to get kids to eat them as well. Out of all the yummy homemade treats we had in class this semester, these were my favorite. With summer coming up, they are the perfect goodie (that’s good for you) to have on hand. Thanks for sharing the recipe! I also have a great recipe for Mung Bean chips. First boil the Mung Been with water into paste in a rice cooker, then use the warmer button to slowly evaporate the water afterward with the lid open. The whole thing will become so crispy and there is no need to add sugar, it’s already sweet to taste! It’s nice to find decent postings like this. I really liked it. I appreciate it. Have a great day. Does anyone know how much calories per cookie or the complete nutritional list? Thanks a lot.